The freshmen have their best meet of the season in a 4th place team finish. Corey Pisapia, knocks down the Frosh 1.5 school record from 1997! His time of 8:15.42 took 4 seconds off the previous school record held by Michael Anderson. He would finish 2nd overall in the race. 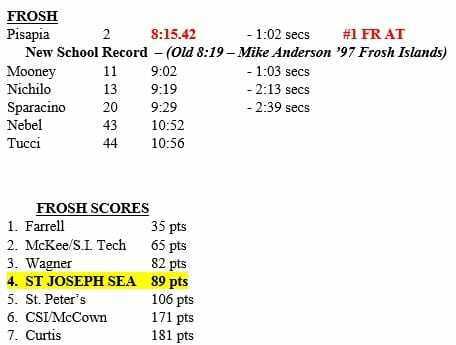 Major PR's were set by Chris Mooney (-1:03 secs), Vin Nichilo (-2:13 secs) and Sal Sparacino (-2:39 secs).